Magazine file offers shelf storage for papers and magazines. Use metal label holder on front to identify contents. Grommet in spine simplifies removal from shelves. 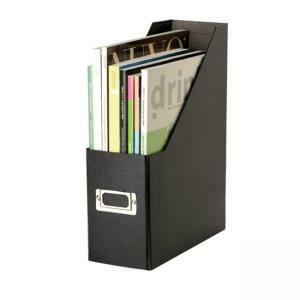 Magazine file is made of heavy-duty fiberboard with water-resistant PVC laminate and contains 50 percent post-consumer material.